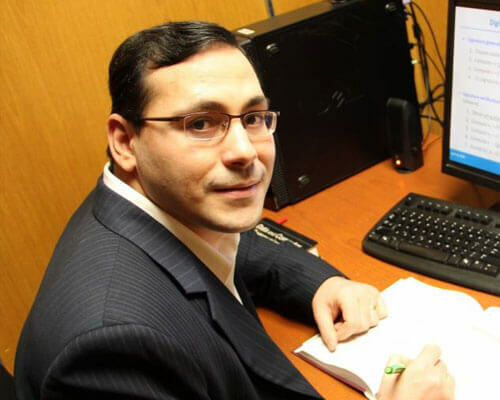 Home » Academics » Schools » School of Science, Engineering and Technology » Faculty » Ayad Barsoum, Ph.D.
Ayad Barsoum, Ph.D., is an Associate Professor of Computer Science and helped create the Master of Science in Cybersecurity program and the Graduate Certificate in Cybersecurity at St. Mary’s University. He also helped bring the Cybersecurity lab to St. Mary’s, developed through grants from the Hearst Foundation and the Valero Energy Foundation. Barsoum has received the Amazon Web Services in Education Faculty Grant for funding his research and teaching activities. At the UW, he received the Graduate Research Studentship, the International Doctoral Award and the University of Waterloo Graduate Scholarship. Barsoum is the author of the book Data Integrity in Cloud Computing Systems: Challenges and Solutions. He published many refereed technical papers in leading research journals and conference proceedings. He has been nominated to the editorial review board of International Journal of Cyber Research and Education. Currently, he is serving as a Faculty Evaluator at the American Council on Education. Barsoum has also been a guest speaker for several international conferences. He is a reviewer for many international conferences and leading research journals that include IEEE Transactions on Cloud Computing, IEEE Transactions on Information Forensics and Security, IEEE Transactions on Computers, IEEE Transactions on Parallel and Distributed Systems, IEEE Transactions on Services Computing, IEEE Access, The Arabian Journal for Science and Engineering, Annals of Telecommunications Journal, and Computers & Security Journal. Barsoum has served in various capacities, including but not limited to: a member of the Institutional Review Board; a judge at the Alamo Regional Science and Engineering Fair; an advisory board member at St. Philip’s College; a chair of School of Science, Engineering and Technology poster competition at the Annual Research Symposium; a reviewer for SURF proposals; and a member of the Cyber Innovation and Research Consortium Committee. Barsoum’s passion for teaching and propagating knowledge to students is his primary motivation to continue his career in academia. Teaching gives him the opportunity and responsibility to contribute in developing young minds by offering them his expertise for a field. He doesn’t just teach concepts to his students; he engages them in discussions and debates. This type of interaction, Barsoum believes, is crucial to helping students understand the subject at hand. Barsoum also brings industry experience to his role as Associate Professor of Computer Science, having previously served as a postdoctoral fellow of Intrafinity Inc. in Toronto. His main research interests include data integrity in cloud computing systems, information and network security, access control and cryptographic protocols, knowledge discovery and data mining.